Hey, everyone. Andthony Wittano here, the Pleiad’s busiest music nerd. 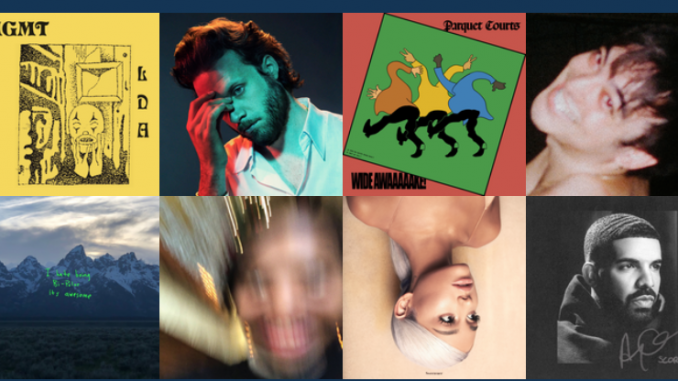 It’s time for my yearly review of what I thought were the best, worst and in-between albums of the year. 2018 treated us to plethora of different releases and attempts at musical game-changers. Some were successful and some were a little behind the curve. Regardless, there was no shortage of thoughts on my own end. Father John Misty — “God’s Favorite Customer”: You know, I’ve never been one to thoroughly enjoy Father John Misty (surname, Josh Tillman)’s music. However I usually hold a decent degree of respect for him, despite his whiny, dystopian perspective of the world. He writes insightful lyrics, as was proven on last year’s “Pure Comedy,” an album that I thought was very lukewarm and only slightly thought-provoking. “God’s Favorite Customer,” though, is nothing new. Incredibly stale instrumentals and self-absorbed lyricism work in tandem to create one of the absolute worst listens of 2018. My hot take: Tillman should give up this shtick while he still has time. Justin Timberlake — “Man of the Woods”: Well, he’s really trying. It seems that the legendary entertainer is at a bit of a crossroads in his career, unsure of whether or not she should label himself as a singer or actor. In fact, uncertainty may be one of the most prominent takeaways from this piece. One full listen-through will leave anyone scratching their head as to what Timberlake was really trying to achieve with this record. Is it country? Disco? R&B? JT seems to be swimming in a pool of ambiguity, and unfortunately, not even production from the legendary Pharrell Williams could serve as a lifeline. Drake — “Scorpion”: At some point, we as humans expose our vulnerability. This summer, that exact revelation for the Canadian rapper arose. Amidst public drama with fellow rapper Pusha-T, Drake was successfully able to drum up promotion for a new studio album with chart-topping hits such as “God’s Plan” and “In My Feelings.” By all regards, these teaser tracks gave us every right to believe that Drake was in top form. The end result, though, was a significant letdown. “Scorpion” is verbose, instrumentally underwhelming and exactly 90 minutes in length. While Drake does remain one of the more impactful players in the genre, this album seemed nothing more than a few bangers with nearly 65 minutes of filler tracks. Jack White — “Boarding House Reach”: An interesting yet notable return for whom I would consider the be one of the greatest living rockers today. The former half of The White Stripes came off a bit of a hiatus to release his most experimental project to date, and the reception was quite mixed. Personally, I saw the album as a mixed bag of successful trials and blatant overdoings. Tracks such as “Connected By Love” and “Over and Over and Over” feature White’s classic concoction of blaring guitar riffs, now with the company of heavy synth beats, adding up to a pleasant futuristic vibe. Other tracks, namely “Everything You’ve Ever Learned” and “Respect Commander,” seem as though they’re floating in space with no direction. While it wasn’t perfect, “Boarding House Reach” was certainly a solidification of White’s musicianship. Denzel Curry — “TA13OO”: It’s truly amazing what the internet can do. In just a few years, the information age has created a DIY platform for up-and-coming rappers to establish a career and following, and the Florida rapper has used this to his advantage. ”TA13OO”, Curry’s third studio album, completely reinvents him as an artist. Whereas past albums tended to follow suit of a typical braggadocious rapper, this latest release takes a stab at creating a concept, which is easier said than done. The album is broken down into thirds, each detailing a different emotion and theme. While these thirds are solid on their own, the compilation of them seems a bit disjointed, almost as though Curry didn’t know how to create a thesis for his album. Regardless, Denzel Curry proves that he is one of the better lyricists and more versatile performers in the industry with this album. As for the conceptual ability? We’ll be waiting on that one. Joji — “BALLADS 1”: Thus far, it has been quite an interesting ride for Japanese-American singer George Miller, aka Joji. As early as 2011, Miller made a name for himself as a belligerent YouTube star, making characters such as Filthy Frank and Pink Guy a household name amongst online memers. However, in the Fall of 2017, he closed to door on his internet shenanigans in pursuit of something new: a serious music career as Joji. What we get here with “BALLADS 1” is a bit of a mixed bag. The same self-depreciation seen through Filthy Frank/Pink Guy translates into more somber, lovesick balladry. The vocal performance is a solid improvement from his debut 2017 EP “In Tongues”, and the production is top-notch. Joji’s inexperience with serious, concrete songwriting, however, is apparent. Despite the growing pains, BALLADS 1 is a decent attempt at displaying the incredibly painful process of heartbreak. “Parquet Courts” — Wide Awake! : “Collectivism and autonomy are not mutually exclusive,” belts front man Andrew Savage on the opening track of the Southern-based, New York-grown band’s newest record. It’s something that seems so familiar, yet so fresh. It’s the same sound of the garage rock band playing at your local bar but accompanied with politically-charged lyrics that some with a bachelor’s degree couldn’t even devise. The continual theme on the album, being “awake” in the age of political deceit and discrimination, is an important step that not many progressive rockers, let alone artists of any genre, are willing to take. Perhaps the cherry on top of this album is the production job done by Brian Burton, otherwise known in the music industry as Danger Mouse. As a whole, he provides more substance to a sound that has continually been reworked and tested by the band on previous albums like “Human Performance,” while also maintaining the organically beer-soaked punk roots upon which the band built themselves. Kanye West — “ye”: Without a doubt, choosing where to place this album was one of the harder choices for me. We can’t control celebrities. What they do and say in front of the public’s watchful eye is an entity of their own, and we are thus forced to be either innocent bystanders or perpetrators of any backlash. It’s no secret that Kanye West had an eventful year, from perplexing luncheons with President Trump to irreverent songs involving “pooping” and “whooping,” I could’ve easily let this whereabouts dictate my thoughts on the two studio albums he released this summer. However, music is meant for more than just controversy and attention, and I think that’s a large part of this album. “Ye,” in its entirety, is a Montana exploration of self-worth, mental illness, and discovery. Tracks like “I Thought About Killing You” and “Violent Crimes” portray West in solid form, despite public backlash. If I were to pinpoint one part of this album to represent its greatness, it would be the track “Ghost Town,” in which “Ye” enlists vocal help from veterans like Kid Cudi and emerging talents PartyNextDoor and 070 Shake. The track itself portrays the freedom of thought coupled with internal struggle, all while holding a hauntingly optimistic tone. “Ye” may be unpredictable, but if he’s proved anything this year, it’s that his musical capabilities are well in tact. Earl Sweatshirt — “Some Rap Songs”: Oftentimes, music begs to be listened to. But, in some rare instances, it begs to be understood. The newest record from the Odd Future-bred rapper does just that. A lot has happened since Earl’s youthful blend of melancholy rap ballads captured the ears of underground rap listeners. His debut studio album, Doris, was both gloomy and introspective. Yet, it was refreshing, coming from a mere 19-year-old that had already dealt with the walkout of his father and a short trip to an at-risk boys school. While Odd Future seemingly lost all cohesiveness in recent years, Earl stepped away from the spotlight entirely, citing issues with depression and anxiety. Many fans began to wonder whether or not the issues he rapped about had consumed him. With this new release, there are many noticeable differences in both Earl’s style and voice. We hear Earl speak in a much heavier, darker tone, almost sounding as though life has knocked the youthful flow out of him. The album, which is a short 24 minutes, follows the short-winded route that many other rappers took this past year (Kanye West, Pusha T, Vince Staples), but doesn’t leave anything unsaid. Many songs either reference or directly sample from his recently deceased father, Keorapetse Kgositsile, a prominent activist and poet in South Africa. Other tracks feature his common themes of depression and self-doubt but with a better sense of understanding. In many ways, this isn’t an “enjoyable” or “easy” listen. It’s sad, it’s bitter and at some points it’s messy, but then again, so is life. MGMT —“Little Dark Age”: As the music publication Pitchfork pointed out in their review of this album, “Little Dark Age” very well could’ve been the last chance for the Connecticut-based duo of Ben Goldwasser and Andrew VanWyngarden. Ever since their debut album, “Oracular Spectacular,” skyrocketed them to the top of the indie music scene in 2007, the group has found themselves in a bit of an enigma. No post-OS release was really able to match the success or acclaim of their debut. Frankly, there wasn’t much effort in the sound innovation field. On what could’ve been their last music leg, the group decided to turn their scope away from music and instead towards society. The result: Their best album yet and the most impactful listen of 2018. MGMT has certainly had a knack for lyricism in the past, but I was nowhere near prepared for the dense layers that can be explored on almost every track on the album. The opener, “She Works Out Too Much,” is a complex lament on a failed love life, dating in the digital age and society’s fixation on exercise and body image, all of which blend in a unique way. It definitely requires more than one listen to fully grasp. From there, we’re treated to the album’s title track, which highlights uncertainty in the information age, especially that of “fake news” and political bias. Perhaps the biggest societal slap-in-the-face on this album, though, is the track “TSLAMP,” or “Time Spent Looking at My Phone.” The duo practically holds a mirror up to a slightly disillusioned society that conantly lives their lives through a handheld retina display. It even includes some self-depreciation regarding the duo’s own technological consumptions. Well-conceived music may be good on first listen, but music that makes us question our own practices is truly something special. What comes next from MGMT? Time will tell. However, in an attempt to save their careers, the risk certainly outweighed the reward. I take that it was your opinion on Justin’s album… but apparently, you really are not a Justin fan. This is one of his best albums. It tells a story, it talks about his love for his family and where he is from. It’s a heartfelt, goofy, love album. I think you should take another listen and really think about what the message is that he is trying to convey.